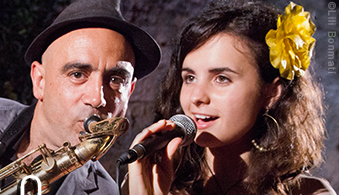 Andrea Motis and Joan Chamorro are considered the revelation of Catalan jazz and Montuno is pleased to welcome them to our international artist roster. The group created in 2009 with its various formations as trio, quintet and big band. The artistic relationship between Joan and Andrea goes back to the Sant Andreu Jazz Band, and in 2010 they recorded their first album together " Joan Chamorro presents Andrea Motis " very welcomed by critics and the public (over 20,000 units sold) . In 2012 they released their second album " Feeling good ", with great success and in 2013 recorded live at the Jamboree a CD / DVD with the great Scott Hamilton, entitled " Andrea Motis & Joan Chamorro Quintet featuring Scott Hamilton " . This is an important addition to our extensive international roster, consisting of artists like Anat Cohen, Angélique Kidjo, McCoy Tyner Trio and ACS . For more information and international booking request please click on this link.